Membership has its privileges, the saying goes. Although the benefits of union membership in the workplace are well documented, what are less obvious are the many benefits available to members when they’re at home. These benefits exist largely because of Union Privilege. Created in 1986 by the AFL-CIO, the country’s largest federation of trade unions, the organization’s mission is to “extend the protection of unions from the workplace to the marketplace.” Union Privilege does just that through its Union Plus benefits and services. “Our goal is to help members live better lives. One of the ways we do that is to help them realize everyday savings,” Collieth Clarke, Deputy Marketing Director, Union Privilege, says — and the first step toward making life better for over 13 million people is making them aware of all the benefits available to them. Union members typically belong to a family with an affinity for their union and solid relationships with fellow union members. So when a union brother or sister recommends something, their word carries real weight. However, turning someone’s willingness to act on a recommendation into a repeatable, scalable marketing channel requires more than just a base of people who like what you’re offering. There’s the testing of incentives to determine the optimal reward, along with determining the best placements for calls to action advertising the program, in addition to other promotions to ensure participation. And there’s the need to track and manage the referrals to make sure participants are properly credited and accounted for. Given all of that, Union Plus decided to look for a partner to help it set up and grow its referral program. Union Plus hoped referrals would increase the number of people participating in the Union Plus AT&T Discount program by 20% to 25%. To date, Union Plus has seen a 93% increase in monthly subscribers online, or a little less than four times its goal. It has also seen people sign up offline for the program after being referred. Offline signups are tracked using a discount code or “fan number” on printed and downloadable buckslips. When new members register for the AT&T program, they reference this number, which enables Union Plus to track referrals that occur offline as easily as it does those happening online. Of course, referrals will only influence members if other members send them. There, too, Union Plus has seen success. Roughly four months into the referral program, more than 3,270 union members have shared close to 7,000 referrals. The key to reaching and sustaining these participation levels has been consistent and prominent promotion that alerts members to the opportunity to help fellow members save money. Union Plus promotes the referral program through its email channels twice per month. Each instance produces large spikes in web traffic. 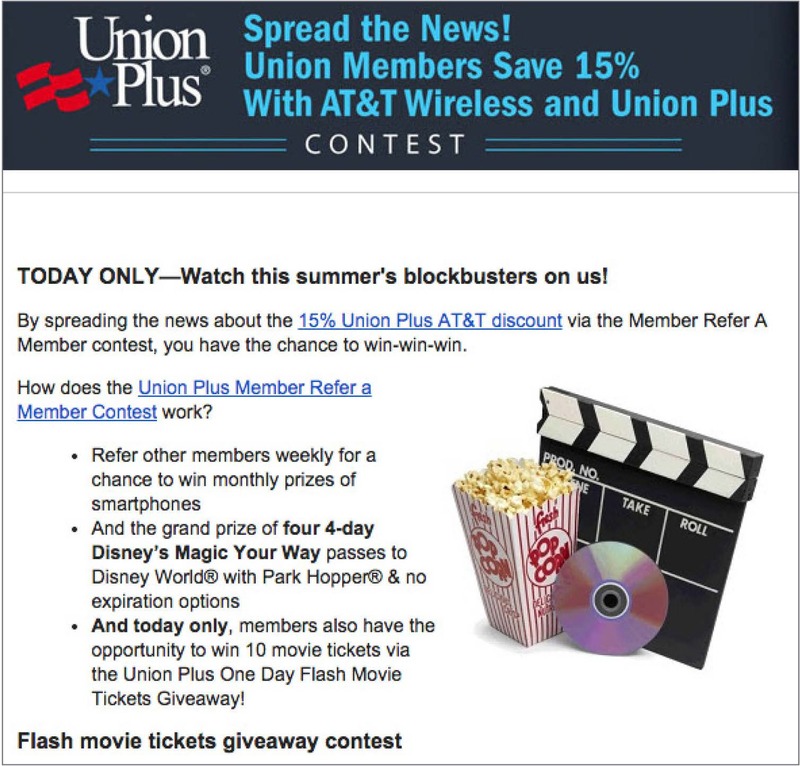 In fact, email promotions that include the referral opportunity are responsible for driving one fifth of the average daily traffic to the Union Plus website, UnionPlus.org. 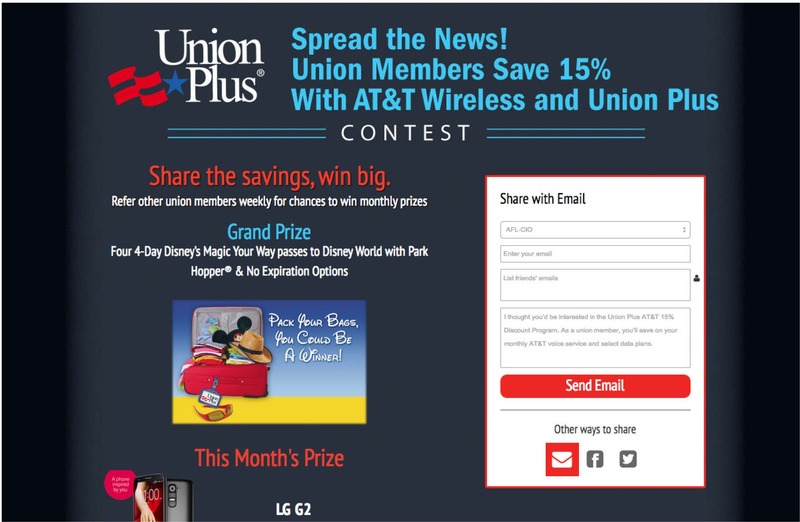 In addition to email, Union Plus promotes the program heavily on Facebook and on Twitter. Union leaders and members are personally told about the program at conventions and events, where the organization sets up booths with printed materials advertising the referral program and other benefits. This referral program is unique in that advocates don’t necessarily earn a reward for referring members to the Union Plus AT&T Discount Program. Instead, members who spread the word about the program have the chance to win monthly prizes consisting of a tablet and smartphones. They also qualify to win the grand prize: four, four-day Magic Your Way tickets to Disney World®. Members also had the chance to win additional prizes through two one-day flash giveaway contests layered atop the monthly contest. These flash giveaways had the greatest short-term impact on referrals. In July, members could enter to win one of three 10-ticket movie packages by sharing referrals. That single-day contest drove 1,281 shares, a staggering increase of more than 2500% from the program’s average daily share total. 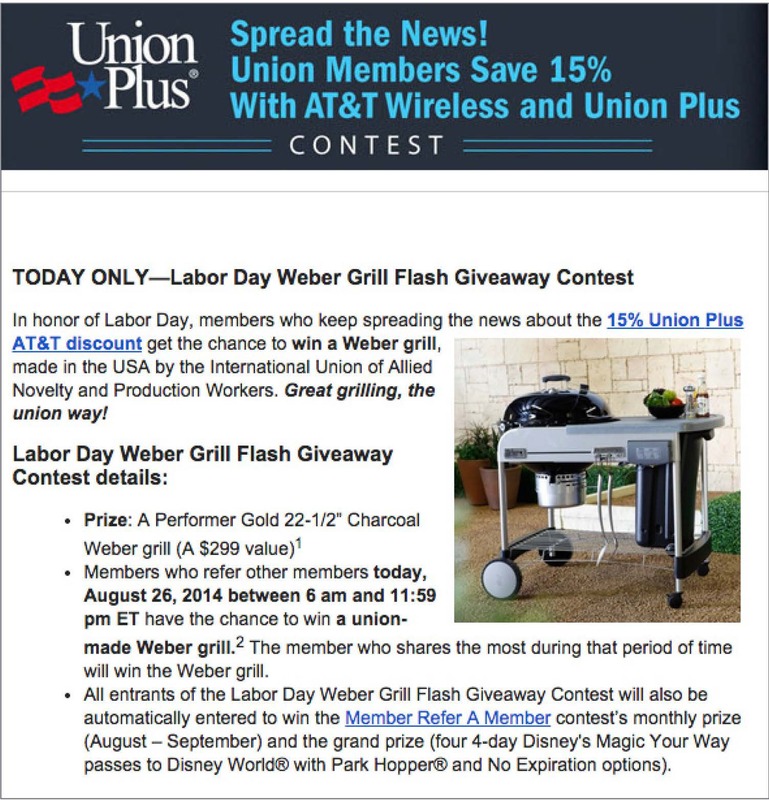 Just before Labor Day, Union Plus ran another contest for the chance at a Weber grill. It drove 1,460% more shares than an average day. The fact that they may not win a prize for sharing referrals with their fellow members hasn’t deterred union members from doing so. After all, sometimes helping a friend is a reward in itself.